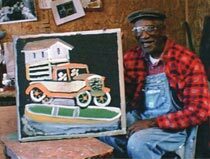 Legendary Outsider artist and blues harmonica player Jimmie Lee Sudduth is perhaps one of the most famous and well loved of all US folk artists. He proclaimed himself "The most famous artist in the world". Born in Caines Ridge, Alabama, Sudduth worked as a farmhand, gardener, and as part of a highway crew. He wanted to be architect and it shows in the details of his paintings of houses from his imagination and cabins from the past. He also painted people, farm animals, and his dog Toto. He generally painted on plywood, using natural materials such as "sweet mud" (a mixture of mud and sugar) as well as house paint. He had been forced to slow down his painting because of his poor health. His work can be found in the permanent collections of the New Orleans Museum of Art and The American Folk Museum in New York. Jimmie passed away on September 9, 2007 at 92 years of age.